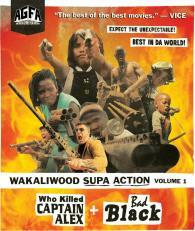 Welcome to Wakaliwood, Uganda: home of DA BEST OF DA BEST MOVIES! and the vanguards of DIY commando cinema! Under the guidance of writer-director-producer Nabwana Isaac Godfrey Geoffrey (IGG) and with producer-star Alan Ssali Hofmanis, this crack crew of self-taught filmmakers and martial arts aficionados produce dozens of gonzo action films in the Kampala ghetto with budgets that rarely exceed $200 USD. Utilizing scrap parts to build computers, machine guns, and a full-sized Huey helicopter, these real-life superheroes inspire more heart, imagination, and soul than a thousand Hollywood blockbusters. AGFA is proud to bring two of the most reckless, out-of-control brain-blasts in the Wakaliwood canon to home video for the first time ever -- WHO KILLED CAPTAIN ALEX and BAD BLACK! Andin Uganda's finest storytelling tradition, the films are complemented by the acerbic wit ofnarrator/VJ (Video Joker) VJ Emmie, who sums up the Wakaliwood experience with a single sentiment: It is a love story . . . LOVE OF ACTION! NOTE: These films were fueled by love and created with DIY equipment. Please approach the technical quality of the transfers with empathy.